Tiki Month is already half gone…at least on the Pegu blog and therefore it´s time i come up with a drink in my next mug of the three i got from the Fireworks Studio. Today the theme is Pineapple! 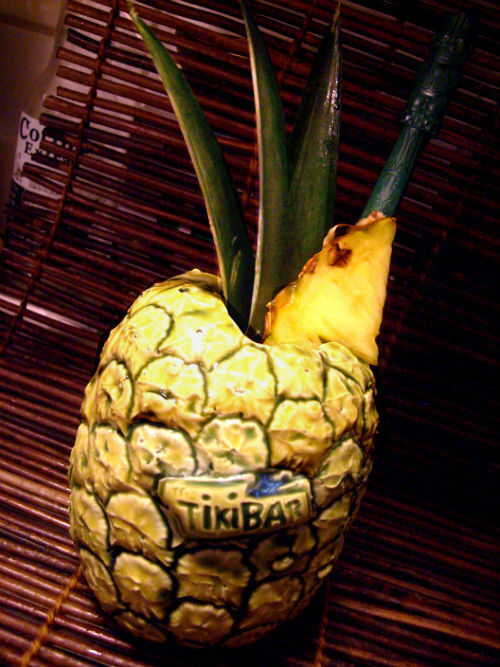 For the pineapple mug i wanna make a drink containing pineapple but not a Pina Colada even though this specific mug is made for the Glasgow Tiki Bar´s Pina Coladas. 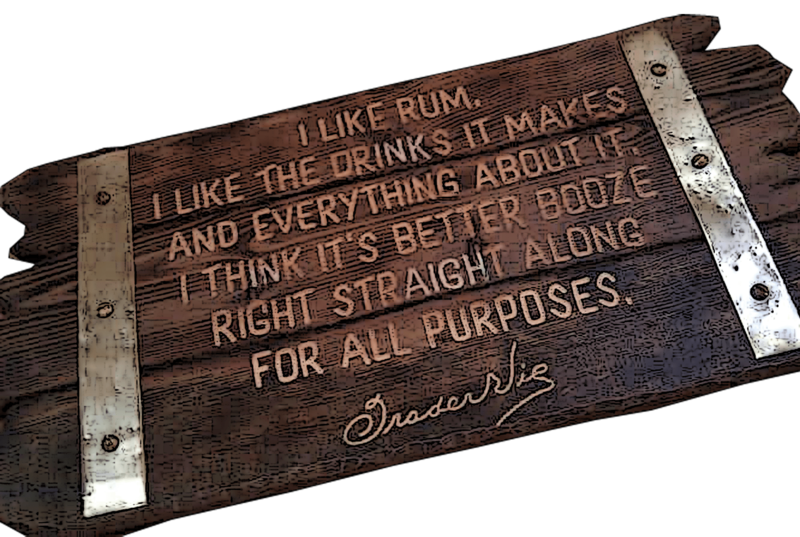 I`m very vey fond of the combination of strong Jamaican rum and aged rhum agricole and so that´s what`s going into this drink which is my own creation. And i`m gonna add some sparkling white wine to the party. The name of the drink means “Pineapple” in Hawaiian which is just about right since the drink has it and the mug has it´s shape…I`ll also add some coffee for contrast – pineapple and coffee is a match made in heaven and a well known flavor combo when it comes to tiki drinks. Muddle the pineapple slices with the syrup and honey in a shaker. Add coffee liqueur, rum and lime and shake well with ice. 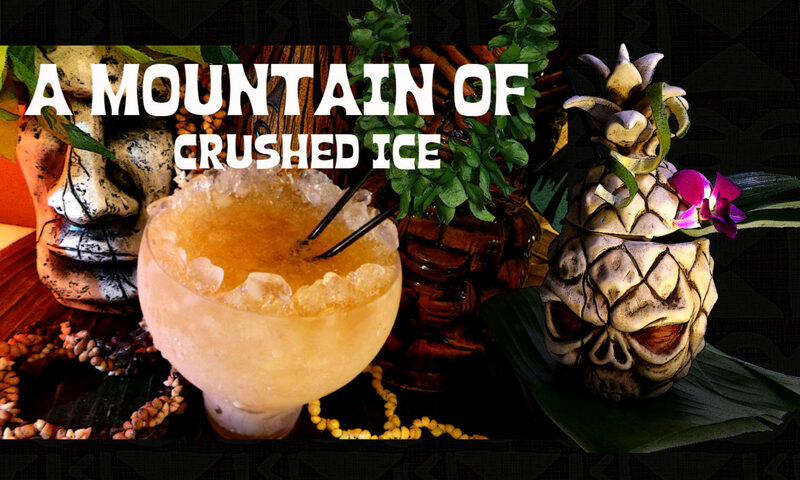 Double strain into a tiki mug filled with crushed ice and top with sparkling white wine. Garnish with pineapple leaves, chunks and maybe a cherry. One thing when garnihing with pineapple leaves, don`t let them sit in the drink for very long because the drink will get bitter. 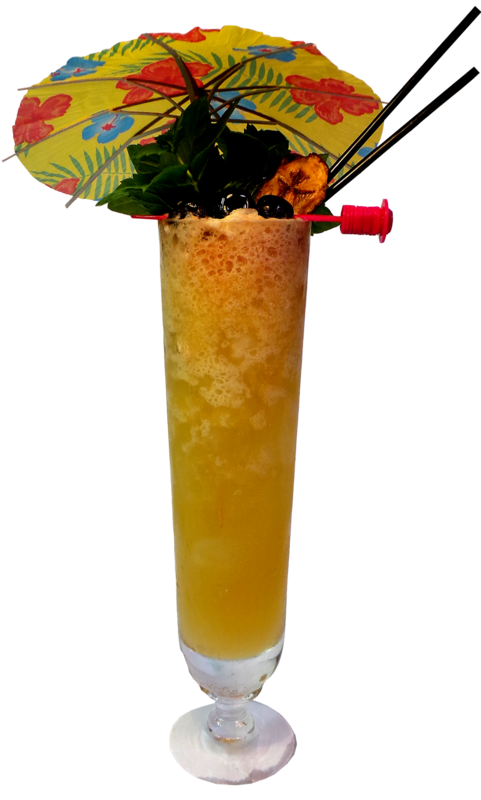 This drink tastes just awesome, it´s fruity, strong and spicy but of course the choice of rums will have a great impact on the flavor in the first place but also the choice of coffee liqueur. I used Fair Cafè which is made from organic fair trade coffee and is very tasty. I once wrote a review of it and the link is here. Now say “Inu A Kena”…which in Hawaiian means to “drink until satisfied” or “drink to quench thirst” – and it also is the name of a very good blog worth checking out!